Ever since coming across a QR code in my passport I have wanted to integrate them into SAP. I like the idea of a "quick response" of data into a mobile device as I hate typing on mobile phone keyboards. Now this is a technical solution and no business case is provided, however the flight demo SAP sapscript and smartforms which will be covered later offer an interesting use of QR codes (in my opinion). *) For simplicity I use the Cute PDF writer to generate the PDF via SAPlpd. A mention must go out to Ghostscript as this is used to do the actual QR Code PDF conversion. 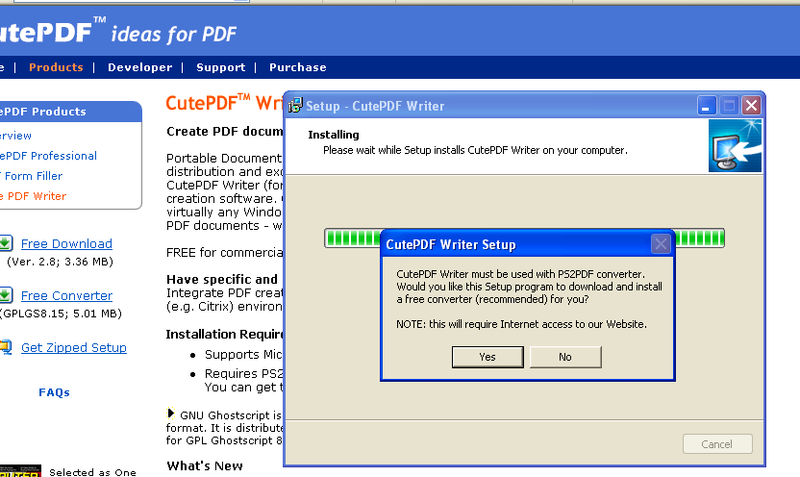 So this needs to be installed as per the instructions for Cute PDF writer. 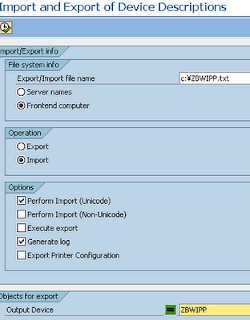 *) Configure ABAP list program/SAPSCRIPT/SMARTFORMS to use the device type printer controls to generate the QR Codes. 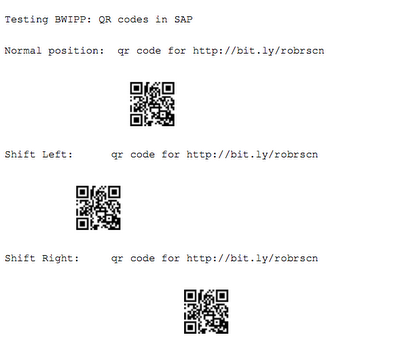 Here is how to generate QR codes in SAP. The ZBWIPPQR.PRI is a plain text file which you can open with any text editor to check it out. It is important to install with the PS2PDF option, so answer yes at the following prompt. 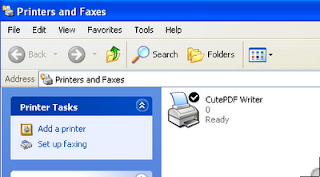 RENAME Cute PDF Writer printer to qrcodes as shown here. Why rename the printer to qrcodes? This must be renamed to qrcodes to match the imported output device as shown below in the SPAD output screen. (SAPLPD will now use the printer qrcodes, in this way it does NOT interfere with any other SAP frontend printer settings you may have). 5) To enable frontend printing please ensure the user settings for spool control are set to "output immediately" in SU01. 6) Import the following example ABAP code to test QR codes in SAP. From transaction SE38 create ABAP report ZQR_PRINT. 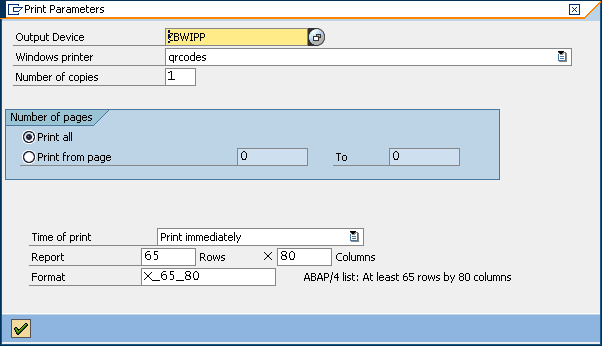 Ignore any warning only messages relating to NEW-PAGE PRINT ON, this is purely used as a simple method to allow the ABAP code to use the printer controls in the device type. Activate the program as the message is only a warning. This is only a test for ABAP list prints. 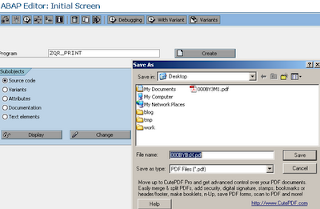 Select ZBWIPP as the output device in the following print parameter screen. *please note that the options shown here purely depend on the options you have active in the user settings. So its important, as previously stated, to have already set print immediately as one of the options. After selecting the green tick mark, then after a short while you should have a prompt to save a PDF file. 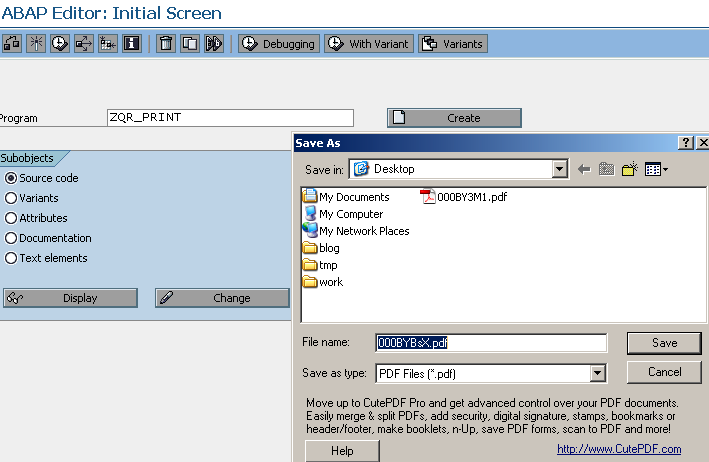 8)... to be continued and the simple next step to use the printer controls in SAPSCRIPT and SMARTFORMS. 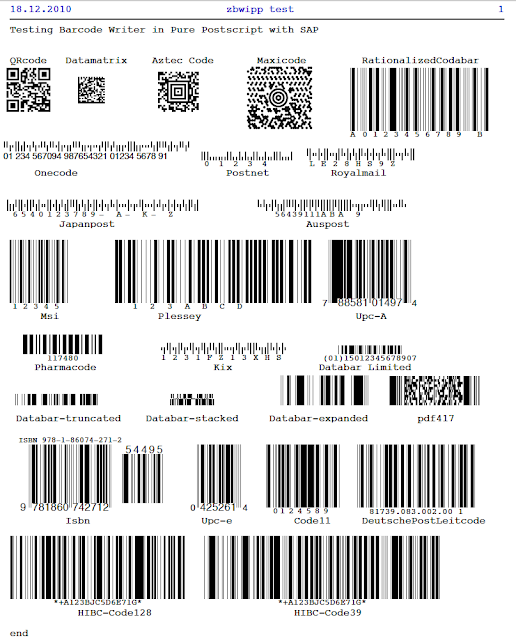 *the video also shows other barcode examples. If you use these SAP barcodes and think that it is worthy of a donation, consider making a contribution to support the ongoing development. Making a donation in no way constitutes a purchase payment for the device types/software. Check out my SCN blogs here. If you are interested in the following screenshot, then follow this link. Only a question, how output device ZBWIPP_DM must be defined? I need to print data matrix 2d code. Then you need to change (or copy) the output device ZBWIPP and point it to the datamatrix device type. Happy to help further if you need any more info. I'm trying to do the PDF conversion with SAP FM 'CONVERT_OTF_2_PDF' but the QR code is not converted, it just converts the embedded text, do you have any idea of what I need to do? The qrcodes are generated with postscript with the Barcode Writer in Pure Postscript. So the conversion needs to be OTF to Postscript and then to PDF. The OTF to postscript conversion is done by the SAP device type (ZBWIPPQR). 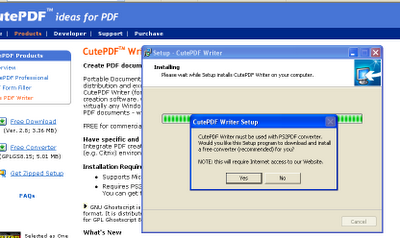 The postscript conversion to PDF is done by cutepdf writer in this blog example. This means that 'CONVERT_OTF_2_PDF' does not do the OTF to postscript part. So will not work. im able to get the barcode as per above steps, but when i scan the QR code there is no information, its blank.can you please tell me if am i missing something. Hi , this comment was marked as spam so not sure if it's genuine . If the comment is genuine can you let me know if you followed ALL the steps in this blog. Hi Robert.. I followed the same steps as in the video for my smart form..but the QRcode is overlapping and with the text i want it to be in QRcode..can you please..thanks in advance. Hi, I will guess that you are looping around in a table with the qrcodes. Worth trying a standard window with a text box and put the print controls around that as a test. Also most likely two issues covered in the following link will fix the problem you have. Let me know how you get on or any further comments. Hi Robert.. thanks for your reply..it seems working fine now..thanks a lot for your help.. Many thanks for those clear explanations. With Sapscript, it was more difficult, i have to insert a space line after the print-control to obtain a Datamatrix. Just a question: is it possible to print a 14x14 or 28x28 datamatrix, instead a 10x10 ? Good to hear you managed to print datamatrix barcode with sapscript. Your question "is it possible to print a 14x14 or 28x28 datamatrix, instead a 10x10 ?" Take a look here at the Barcode Writer in Pure Postscript wiki for Datamatrix. On this page there are options for 14x14 but not 28x28. Therefore lets use 14x14 & 32x32 as an example and setup these in the SAP datamatrix device type. We need to reference the options "rows=14 columns=14" & "rows=32 columns=32" as print controls. Start transaction spad and select the ZBWIPPDM device type. Select the Print Controls TAB. if required add a new row with ZOP04 with the rows=32 columns=32 options. 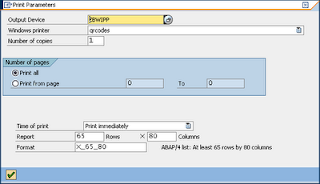 I tested with a quick abap report and should work fine for sapscript by using the new print controls as follows. *You should note, with the new print controls you really need to know the maximum amount of characters you pass to the device type. As standard BWIPP to sizes the datamatrix to the correct size depending on the amount of characters passed to encode. If you send too many characters to a barcode that is limited in size you will not see any barcode in the printout/pdf. Also back to your original comment, if you don't mind expanding on "i have to insert a space line after the print-control to obtain a Datamatrix". May help someone else if you can explain how you add that space line in a bit more detail. Happy to help (if I can :) if you have further questions. I managed to print QR code via sapscript. But charset is broken. Some characters are misprinted (Č,Ž,Š). I was trying to change charset from original 1117 to Central European (1404), and UTF-8. It is possible to printout characters like "Č,Ž,Š" in your printer. And if it is, how can I do that. Never looked into Central European language requirements before but I am interested to see what can be done. 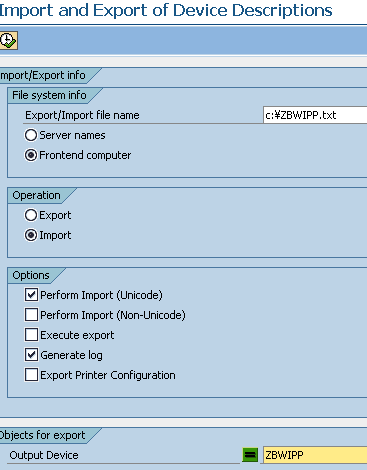 ZBWIPPQR is a direct copy of POST2 postscript device type in SAP. So if we can identify a POSTSCRIPT device type that can print those characters adding BWIPP should be very simple. Therefore identifying the device type to start with is the issue. A quick search of SAP notes I came across this one. It is an *obsolete* note but indicates that SAP only produced a device type for HP printers. 1) do you use HP printers? 2) How do you print at the moment, dedicated printers or via windows frontend. 3) which device types in SAP do you currently use. 1). Currently we are using HP printers via windows frontend in our environment. As you pointed out earlier in replay to Michal Veščičík, POST2 printer used for ZBWIPPDM device type is Latin-1 and therefore Central European chars are not displayed correctly. I found SAP note "Note 575916 - PostScript device type for ISO 8859-2 (Latin-2) and HP" which includes device type ZI2HPPS.PRI and I wonder if it is possible to merge it somehow with ZBWIPPDM to enable printing of CE specific characters? 2). I need to produce the data matrix barcode based on the following data structure (AI stands for Application Identifier like in EAN128): (AI '10') + 10 chars of data + (AI '240') + 18 chars of data + (AI '3142') + 6 chars of data + (AI '400') + 8 chars of data. For EAN128 I programmed these AIs as special FN codes but since I am not familiar with data matrix encoding I failed with issuing correct data string to ZBWIPPDM (barcode is not appearing on the printout at all). What would be the correct set of control commands between 'ZBW01' and 'ZBW02' to have a correct data string (incl. FN codes) passed to ZBWIPPDM in this particular case? Good to hear you managed to print out the data matrix barcodes on your system. case you could print direct to an HP printer. next step and add the barcodes. and this type of datamatrix which could be created. GS1 DataMatrix is an implementation of Data Matrix ECC 200 with GS1 formatted data. Also using the parse option could a possibility. Have a read of my very last comment on my page here. It covers the ^nnn style notation for special characters. There is also another option in adding a brand new print control for the following from the datamatrix wiki. "When the parsefnc option is specified, non-data function characters can be specified by ^FNC1 through ^FNC6"
Let me know on the above and happy to help out further if required. Adding the barcodes should be straightforward, I have some time over the weekend and will download ZI2HPPS.PRI myself and test it out. I will get back to you via this comment section. Should have something fairly quickly to share here. i have tried the same thing for smartforms but every time it gives me a same output with different value on mobile(Barcode Scanner). Brcode is getting scaned but values are not coming. If i pass the same value from report it gives me proper output. All known issues have been fixed that I know of by following the steps in the above link. I did read the SAP note related to the device type and downloaded the ZI2HPPS.PRI device type. It does appear dedicated to the printers so any tests for the CE characters would have to be on your side. Although it is postscript and a quick test proves it can be integrated with barcode writer in pure postscript. In the first instance it would be easier to setup along the lines of the following post. I could have a first version of ZI2HPPS.PRI with the barcodes integrated very soon. So if you are still interested, let me know and maybe we move to email exchange as it may be easier to continue tests and setting it up that way. Thank you so much for looking into ZI2HPPS.PRI device type and for the wonderful news regarding its compatibility with the barcode writer. Of course I am still interested in your help and moving to email exchange sounds very reasonable. Here is my email address: develooper.sap#!#gmail.com (please replace #!# with @). In the meantime I will go through the post you mentioned in your replay. Thanks for taking the time to comment on the blog and good to hear that it worked out and met your requirements. how about you send me an email as maybe we need to determine the level of help you think you need. Email would be better for that. You can find my email address at the following SCN link. A quick search via google and you need to pass 9 for horizontal tab, in exactly the same way you passed 10 & 13 for carriage return, line feed via the parse option. You are right on trail & error basis i passed ^009 & as of now it is working fine. By the time of testing you replied. Is there any restriction on number of characters in barcode to be printed. My Barcode conatains more then 230 characters. Sorry for giving you problem again. Not sure exactly what you are trying to do but if you position and size the qrcode correctly on the page or in a window then it should be ok with the number of characters passed. I would suggest you need to know exactly the amount of characters each time (e.g. pad the text if necessary to a known length) then you a dealing with consistent data. I download and install it , it can be printed QR code. very good ,thank you! But I found that if the content contains Chinese, it will be garbled. I would suggest you test out a postscript device type that supports Chinese first. Stanalone without any barcodes and check the output is to your requirements. If it is fine then you could try the linking method described in the blog above. Any further questions let me know, happy to help out where I can. Are you happy that your email address is in the comments and would you want me to delete that? Hi Robert, could this be use, with an printer, and configuring the label format? Also, could we set trigers when every "x" item has an goods issue , been add to the company dababase we will print it? 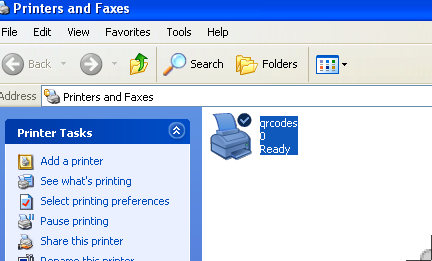 The QRcodes can be printed on a postscript printer or a printer that can support postscript via a driver. The label printing sounds possible although I am not sure I follow your requirement for every "x" item. The QRcodes are produced via print controls so if you can program a print control every "x" item then it should be possible. I've been able to print the QR codes like you instructed in this post, works like a charm! But now i have a requirement to print the QR codes in a smaller size..
Is there any way I can print a barcode in a smaller size? My client has a bardcode printer, can't remember the model now, could i use a Smartform to send it straigth to this printer, without using the cute pdf printer?? Apologies for the delay other things took up my time. The BWIPP does a great job in auto calculating the size of the required qrcode and trying to control it can lead to issues if you do not know the maximum number of characters passed to the qrcode. The above post as a link to my updated device types with the qrcode optimised for size. I am trying to send MAXI code as pdf attachment through Mail. I have downloaded from and configured however the result is not I expected. Would appreciate if you can guide me, how to achieve my requirement. Not sure how exactly you are emailing from SAP however if the device type and postscript interpretar (ghostscript used by cutepdf) are bypassed then there will be no Maxicode produced. The requirement could be achieved outside of SAP with PDFCreator. It was good document . We tried printing the UPS maxicode by downloading the device type. When we printed using PDF creator it is working fine. Instead to printing the barcode we want to used smart form and trying to email the UPS label to customer by converting PDF inside the program, but barcode is not appearing correct. Only option is to try outside of SAP as the SAP standard is OTF to PDF directly and misses out the postscript conversion required for the barcode. Outside of SAP PDFcreator does offer an email option. Thank you for the inputs , I will try on the same. Yes that blog's method should work with maxicode as well. Hi thanks for all here. My expirience: Installing SAP Sprint from SAP you can get rid of any of those PDF stuff - i was fighting for 2 days to make it print on different printer. So you need to install sap spring service, change in SPAD spool type to U (Berkeley protocol (BSD)) and you can specify any printer on any server you like and ii is working:). Without any "free" pdf software.